The toxicity of radiation exposure is nothing more than increased oxidative stress in the exposed area. Regardless of the type of radiation exposure, the damage inflicted in the exposed areas of the body is always caused by increases in oxidative stress. Massive radiation exposures, as inside the core of a nuclear reactor, can kill quickly as the rapid rise in oxidative stress in and around the cells ultimately causes them to stop functioning or simply to rupture. This is why focused radiation can be used as an effective cancer therapy – for some individuals. Medically-induced radiation 'therapy' massively upregulates the oxidative stress of cancer cells and they rupture or just stop replicating (along with some exposed normal cells). Intense antioxidant therapy effectively treats most radiation exposure. Really, the only radiation exposures that are not effectively treated by antioxidants, such as vitamin C, are those resulting in too much tissue damage too rapidly. Every medical condition has a point of no return, where even the most appropriate therapy does no discernible good because organism shutdown and death are imminent. This is case for all forms of life, including plants. C'mon, Dr. Levy! Is there anything that he thinks is not treatable with vitamin C? This is a valid question that I know some inquisitive readers will ask. The truth of the matter is that all known medical conditions, regardless of what initiated them, result from variable degrees of increased oxidative stress in different tissues and parts of the body. And while I would never advise someone to rely solely on vitamin C for the treatment of many different diseases, it would be absolutely foolish not to take advantage of the many benefits it offers while taking other recommended and effective therapies. Except in the rarest of circumstances, such as the induction of a rapid detoxification, vitamin C and other antioxidants will reliably lessen, and occasionally eliminate, the associated symptoms and gradual tissue degeneration seen in nearly all diseases. Is this just speculation? Or, has vitamin C been shown to have this effect on radiation exposure? The Fukushima nuclear accident in Japan certainly heightened the fear of radiation exposure throughout the world, and rightfully so. Single limited radiation exposures are easily treated by antioxidant-based protocols. Ongoing, high-dose radiation exposures that do not dissipate cannot be expected to relent to any therapy. Dr. Atsuo Yanagisawa of Japan showed that even moderately-dosed vitamin C was able to prevent the Cancer Risk Score, associated with the release of free DNA from radiation-damaged cells, from increasing during an extended treatment period on four workers who went directly into the damaged plant to effect repairs. A single 25-gram infusion of vitamin C was given, and daily oral supplementation was then continued, including 2 grams of liposome-encapsulated vitamin C, 600 mg of alpha lipoic acid, 400 micrograms of selenium, 400 IU of vitamin E, and a multivitamin complex. This is not astronomical dosing by any measure. A sizeable body of research has also shown that vitamin C, with or without other antioxidants, has been able to block and/or reverse the damage inflicted by radiation exposure in the test tube, in test animals, and in patients receiving radiation therapy, as for cancer. Prevention is better (easier) than reversal - every time. Unless (or until??) nuclear accidents become more common, the main concerns most individuals will have toward potential radiation toxicity will come from radiotherapy for a disease such as cancer, or from any of a variety of radiation-generating tests (mammography, X-rays, airport screening). It is always good to get as much vitamin C on board as possible before such encounters, as it is always easier to prevent damage than to repair it after it has occurred. Like with any other medical condition being treated with vitamin C, it is always best to err on the high side in dosing, whether the intent is to prevent or to repair. 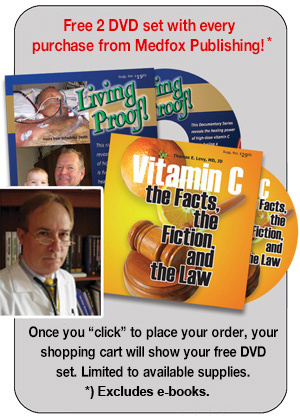 Individuals who chronically dose vitamin C and antioxidants will always have better antioxidant reserves in their bodies, and less vigorous acute supplementation will be required in the situations noted above for such persons.